Dutch label Clone Records is well-known for names such as Reggie Dokes, 2562/a made up sound, Adult., Alden Tyrell, Dexter, I-F, Dopplereffekt, Legowelt, Duplex, Drexciya, Elitechnique, Putsch 79, Larry Heard, Marshall Jefferson, Marco Bernardi, Bangkok Impact, Kettel, Serge, Cosmic Force, Orgue Electronique, Fred Ventura, Scott Grooves, Mike Dunn, D.I.E. and many others. Giuser is a Romanian DJ, with a special, very personal sound. 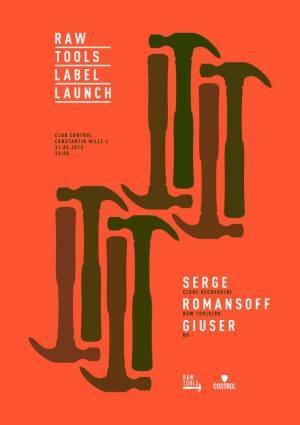 "Serge (Clone Records) @ Raw Tools Label Launch" Party in Bucharest. You can get here description, reviews, address, time and details of "Serge (Clone Records) @ Raw Tools Label Launch" Party in Bucharest. Visit Bucharest Tips for more Party events in Bucharest!